Here are the instructions for accessing Destiny (our library catalog) from your classroom or home to reserve books. Go to http://destiny.wcpss.net/ . Click on the Destiny icon under Media. Click the login button at the top right. Username is 449 and your Lotus username (no spaces). Password is 449 and your 6-digit employee number (no spaces). To access Destiny from home, go to http://destiny.wcpss.net/. Then click on Holly Ridge from the list of schools. Log in as above. Teachers need to login under their personal username and password to view hidden materials such as videos and leveled books. We hide these so as not to confuse students in their searches of the database. The search stations in the library are always set up for student use. 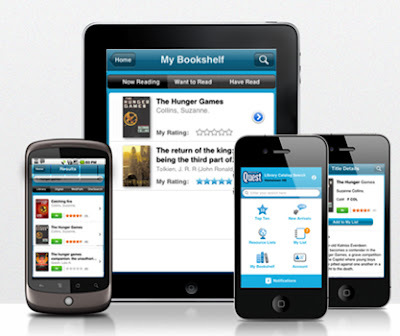 Access the library catalog with your ipod, ipad, or smart phone. Click the picture below to begin.